Having now completed the Scott Bader approved installers course for their Crystic Roofing products I can now show you the full story of what is a very durable roofing system as an alternative and one I highly recommend over conventional roof coverings for flat roofs and many other types of roofing structures both domestic and industrial. The video is the full story about the product and the company and you can watch all or just play the first few minutes to see exactly how good this system is and why it’s so durable. Also take into account they have made boats from this principle for years and if it doesn’t work then they let in water and sink ! I am happy to give estimates for any work you require so once you have seen the video and looked at the product use my contact details to discuss your requirements. 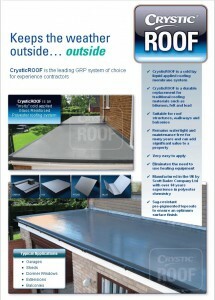 CrysticROOF is an in-situ, cold-applied, glass-reinforced polyester roofing system which provides a powerful, leak-free, long-lasting alternative to traditional roofing materials, such as bitumen, felt and lead. CrysticROOF provides a high performance solution for all roof structures, including flat, valley and pitched – and for all shapes, including walkways, roof-lights and balconies. 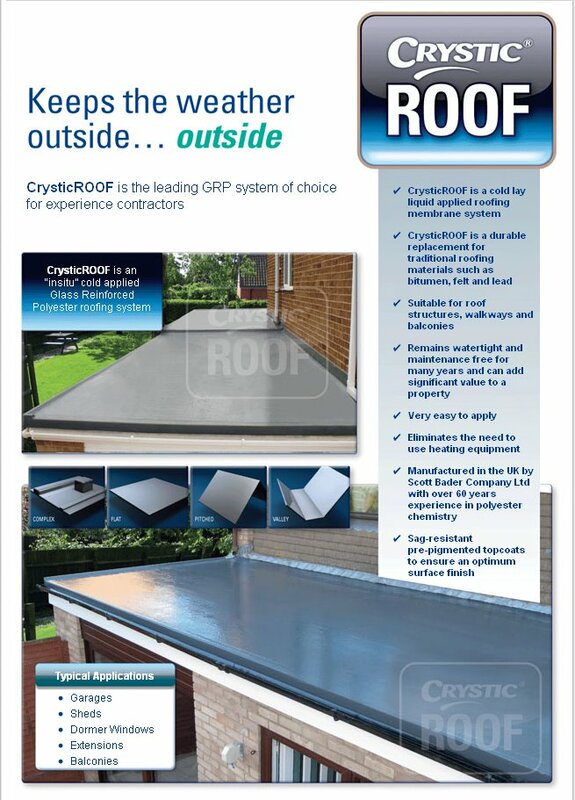 CrysticROOF eliminates the need for heating equipment and, when applied correctly, remains watertight and maintenance-free for many years CrysticROOF is manufactured by Scott Bader Company Ltd – a company with over 60 years’ experience in polyester chemistry. Scott Bader Company Ltd has an excellent reputation for manufacturing high quality materials backed by unrivalled technical expertise and customer support. This entry was posted in Flat Roofs and tagged flat roof, suppliers by admin. Bookmark the permalink.